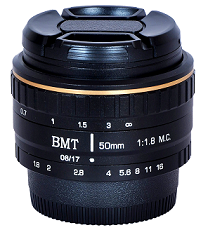 BalaJi MicroTechnologies (BMT) is India's Leading manufacturer of large format F-Mount Machine Vision lens. The company designs & manufacture large format F-Mount lenses. We holds very strong expertise in offering our customer's dedicated one-stop machine vision solution for all their optics requirements in building their machine vision system. "Recognized as best Machine Vision lens Supplier in the Industry"
We are into design & manufacturing of wide range of machine vision lenses under brand name “BMT” known as BMT Machine Vision lenses, With strong in-house R&D & design efforts, our 35 MM & 50 MM F Mount lenses are developed with optimal precision techniques & produce high quality images. Our camera lenses are actively implemented in applications like Machine Vision, color sorter machine, ITS/Surveillance, Medical Imaging Applications & many others etc. machine vision, Machine vision lens, Machine vision lenses, Machine vision camera, line scan camera, f mount lens, f mount lenses, line scan cameras, BMT, board camera lens, m12 mount lens, colour sorter, color sorter, colour sorter machine, image sensor, ccd image sensor, Nikon lens, Nikon Lenses, Sony camera, Sony cameras, Watec camera, watec 902B camera, ricoh lens, Ricoh lenses, sunex lens, sunex lenses, sunex board lens, CCTV lens, 50 mm f mount lens, 35 mm f mount lens, ccd camera, camera lenses, BMT Lens, BMT Lenses, Cctv camera. BalaJi MicroTechnologies (BMT) is New Delhi, India based company, We are privately held & registered in India as per Indian companies’ act. We are unit of B.B. Group of Companies, India. BMT is India's leading manufacturer & supplier of high quality Machine Vision Cameras, Machine Vision lenses & complete machine vision systems under our brand name "BMT". Our company core interest lies in ITS/surveillance, FA/machine vision and medical imaging domain." In addition to this, Our company is also associated with global leading players, We distribute & sell their product line into market.